Another Monday, another blank design wall. I'm making good progress in getting all my fabric bits and odds and ends sorted and cut into regular sized pieces, with the leftovers going into either string or crumb containers. I really want to start life in the new apartment with a fresh and organized approach to all my fabrics, both stash and scraps and crumbs. It's a lot of work, and quite tedious, but I think I'll be glad to have it done. The only problem... I'm starting to have sewing machine withdrawal. I have all these gorgeous strips and bits, and now I want to sew something with them. LOL!! 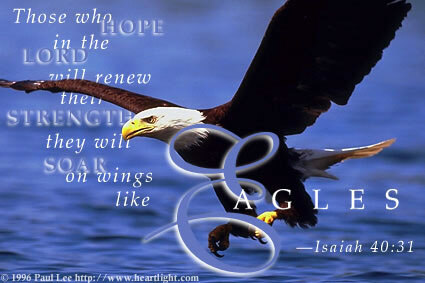 But I have promised myself that I will persevere, and get it all done. However, I do have a picture of a finish that I can share. Nathan's quilt is done. 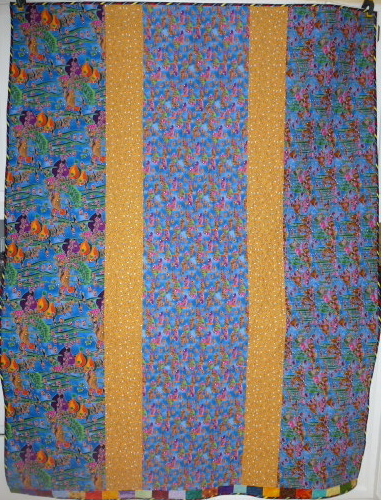 This is a pattern from Judy Martin's book Patchwork Among Friends. The pattern itself is called "Forever Friends". This one was so much fun to do, with all the bright colours, and the novelty prints at the center of each of the stars. It was doubly fun, because I started this at a Quilt-til-you-wilt day, sponsored by the guild back in November. I had so much fun sewing in a group, rather than by myself as I usually do. And Gail helped with the pairing of the fabric colours for the star points, the backgrounds and the center print. I especially like this one. For the backing, I used up the last of the fish themed fat quarters that I had that were simply too cute to cut up. All three of Lisa's boys have backings made out of fabrics from this collection. 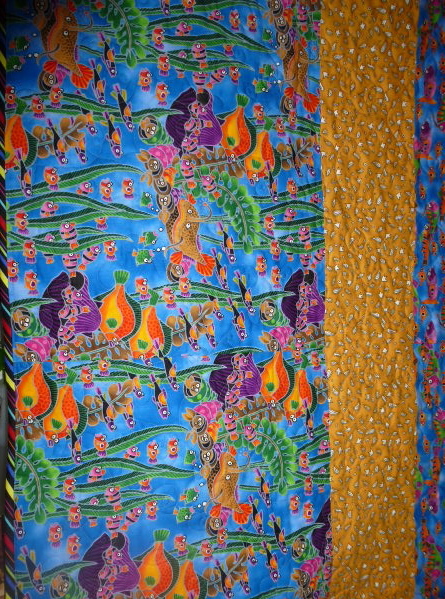 Here's a close up of some of those fishy fabrics. I'm Linking up to Judys' Design wall Monday at Patchwork Times. I'm working the next 3 evenings at the hospital, but I might be able to get more ironing and sorting and cutting done before going in to work. I am determined to get that chore done, and to never let it get this bad again. Edit: Here it is, Friday already, and I haven't had a chance to write another post. But, I'm going to kink this one to Crazy Mom Quilts, where every Friday there is a link up to celebrate our finishes. The last stash report of the year, wow. How did that year fly by so fast? For that matter, how did this past week fly by so fast? I can't even blame it on lots of family busy-ness over the holidays. We had a very quiet Christmas day over at Matt and Becca's We were supposed to go to Lisa's yesterday, to celebrate Christmas with her and her husband and their 3 boys, but she had to cancel due to the flu coming to visit at their house. So, we'll have to reschedule that one, once they all get over it. Matt and Becca were very generous with me this year, and put together a fun collection of fat quarters as my Christmas gift, so that will get added to the finial year numbers. Balance: 33.95 more yards in than out. At this time last year I had used 154 yards and added 162.5 yards, and so ended the year with a balance of 8 more yards in than out. My in numbers were actually very close to the same, which I find rather surprising. I thought I'd bought a lot more this year than last. I'm going to continue with stash reports next year. I find I enjoy the exercise. I don't have a particular goal in mind. I don't feel a need to control my intake, or minimize it. I've actually found, since I've had to organize it in order to move it, that my stash is not all that large. I have, however. found that there is a lot of stuff that I have had for years that has remained unused, languishing buried on the fabric shelves. One fabric has a copyright date on the salvage of 2002. And there are likely some that are older than that without dates on the salvages. I think that might be one of my focuses for the coming year - to use up some of that older fabric, even if it only goes into pieced backings. I've been spending the last couple of days cutting up the odd shaped pieces of fabric, and small leftover pieces of yardages that have been cluttering up the sewing room. I had all kinds of ends of fabrics, that needed to be cut into usable sizes, So I now have even more 2 1/2 inch strips to add to the collection, using that fabulous invention, the Go cutter. I've separated them out into lights, mediums and darks. I think I'm going to go through the other 2 1/2 inch strips that I already have, and do the same thing. The pieces that were too short to actually count as strips, I've cut into squares. I have a couple of projects on my Pinterest want-to-do list that use 2 1/2 inch squares. One project, from the Moda Bake Shop, need 5 squares of the same fabric, so I've been making sets of 5 and pinning them together. Another project that I want to do, I saw here, and it will require 9 squares of the same fabric, so I've been pinning together sets of nine, if I have that much of one fabric. When I get enough sets for either of these quilts, I'll start putting them together. Then, I'm also doing sets of fours, although I'm not sure just yet what they will turn into. The rest are going into the 2 1/2 inch bin to be used as leaders and enders. It is slow going, but no where near as slow as if I had to do it by hand, rather than with the Go Cutter. I've been doing a few 2 1/2 inch half square triangles as well, in lights and darks, although I have no idea at this point what I'll do with them. But they are there for when inspiration strikes. The remainders, if big enough, are going into string and crumbs boxes, so not very much at all is going to waste. I'm linking up to Judy's Stash Report at Patchwork Times. I managed a little stitching this week, but not much. There is a little bit to show on the Grandchildren stitchery. I got stalled on some feather stitching down in that bottom rose triangle. I miscounted, and now have to take it out. And it is such a pale green, I'm wondering if I should change out the colour to something that will show more. It seems an awful lot of effort to go through for something that will barely even show. I decided to do something fun and fast and easy on it. There are a lot of dots fabrics in this quilt, so I decided on loopy bubbles all over it. Balance: 29.3 yards more in than out. I've ended my fabric diet, and caved in and ordered a whole pile of stuff from Thousands of Bolts, who are having their huge end of the year sale. I don't know exactly how much I ordered, but it was a lot. However, I'm not going to count it until after we move and unpack it. For now, once it gets here, it will stay in the box. 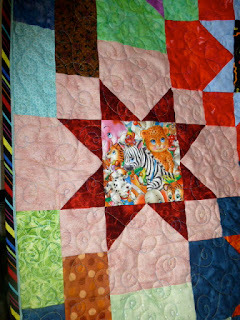 I'm linking up to Judy's Patchwork times for the Stash report, and Kathy's Quilts for the stitching report. It's Friday, and I have another finish. "Think Inside the Box" is finished. It is from the book Geometric Gems by Cathy Wierzbicki. This one was a lot of fun to put together, choosing all the fun fabrics for the boxes, and the colours for the edges of the boxes, as well. The binding is done with a really bright diagonal stripe, with a narrow piping fabric of a yellow, with red dots. This one is for our grandson Lucas for Christmas. I hope he has fun looking at all the fun things in the boxes. He's 2, so he can learn all kinds of words and colours as he grows, and learns to play the game I Spy. There has been progress in our new living space. The ceilings are all up, and a coat of primer on them. And that black thing along the wall is the new fireplace. The kitchen area is all roughed in and ready to receive cupboards and sink and appliances. 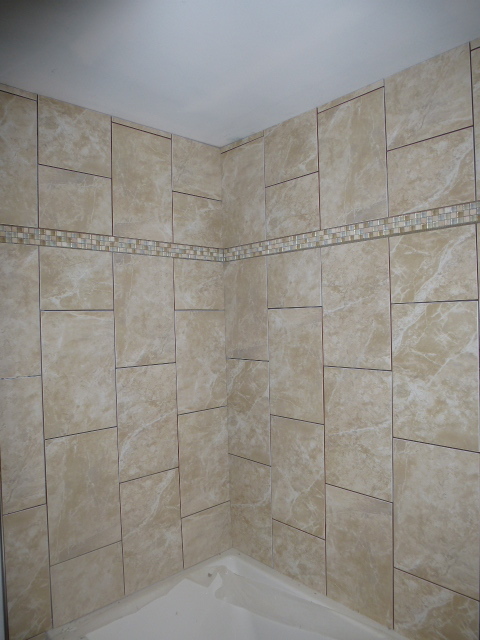 And the tiling has begun in the bathroom. There is going to be a workman in over the next week to do the refinishing of the floor. 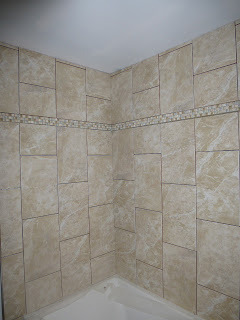 So, come the beginning of the new year, the tile in the bathroom will get finished, and the kitchen put in. It's getting closer to being a reality. The stash report is easy...... nothing in or out this week. Too many hours spent working at the hospital, and the rest of it was spent trying to make order out of chaos in my sewing room. It is slowly starting to happen. I'm going to spend some more time working at it today, and hopefully get the remaining 3 yards and under pieces all bolted up. Then there are the longer yardages to do, and lastly, sorting through all the smaller pieces, and get them cut into either strips or squares. The hand stitching has been going well this week. The last of the stockings is finished, this one is Noel's, and ready to stuff, with 9 days to spare. Whew!! Now all we have to do is figure out what to put in them. and then go out and do the shopping for it. That's on the agenda for tomorrow. Then I spent last evening stitching on a project that I had originally bought as a Christmas gift for my Mum, years ago. Her eye sight and her health failed, and she was never able to start it. But it somehow seems appropriate, now the we have grandchildren, to work on it, and get it finished. I can't find the picture of it, at the moment, but eventually it ends up as a sampler of different stitches, with the grandchildrens' names in the corners of the outer edges. This is going to be a very long term project. In fact, the grandchildren might be adults by the time it is finished. LOL!! it will be really easy to take stuff out of the drawers before refinishing it. While Becca was working on the fat quarters, I continued with making the mini bolts out of my yardage. It's almost done. I think they look rather pretty all lined up in rows on the shelves. And it's amazing how much less space the fabrics take up this way. I've been putting everything under 3 yards onto these mini bolts. Everything over 3 yards is going to go onto regular sized bolts, also made out of the foam core boards. But, that's for another day. For the rest of the evening, I'm going to sit with my feet up, and stitch. Another Monday with nothing new on my wall. I've finally decided that it is time to start doing more than thinking about packing up my studio and getting ready for the move which is about a month away. I've been trying to figure out a good way to store fabric in a neat and orderly fashion, since my sewing area is going to be in our main living space, and not hidden from view. I saw an idea. on this blog for making up mini fabric bolts. She used comic book boards to form the center section that the fabric wraps around. However, I couldn't find any here, and for some reason, the online stores wouldn't ship to our address. Amazon.ca had them, but they were combined in a package with envelopes, which I didn't need. So I had to come up with another solution. This is where our local Curry's art supply store came in. They sell sheets of acid free foam boards for $4.85 each. The boards are 32 x 40, and bout 1/4 inch thick. So what I've done is cut them up into 8 x10 inch little boards using an exacto knife and my trusty quilting rulers. That gave me 16 mini boards out of each sheet amounting to 30 cents per little mini bolt...... not bad. Plus they have a lot more body and strength to them than the cardboard would have, which means they will last longer. and then folded again along the length. 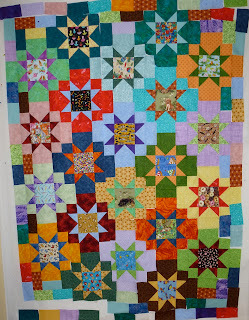 I'm linking up to Judy's Patchwork Times Design Wall Monday post. I finally have some hand stitching I can show. The past month or so has been occupied with working on Laurie's stocking, which I will show pictures of after Christmas. But all 4 stockings fronts are now finished, and 2 of them are complete, with backings sewn on, and linings sewn in. Matt's is one of them. His was the first one I started, way back last February. He is an avid golfer, so when I saw this golfing snowman, I knew it was his. Those golf clubs in the golf bag actually come out!! It is lined with a Christmas feeling plaid. I am working for the next week, with the exception of Wednesday, so I will be taking the others to work with me and soing the finishing hand sewing on my breaks. I have really enjoyed doing these, but will be glad to have them done. With the exception of the Promises and Borders blocks I have done, these have taken up all of my hand work time for the past year. Come January, or maybe even before, depending on when I get these done, I want to get back to working on applique, and maybe some knitting too. There has been a bit of stash usage this past week, bindings, some 9 patches for a swap at the guild, and the fabric for the stocking linings. Balance: 33.8 yards more in than out. I won't be hitting a zero balance this year, but that's OK, since it never was my goal to do that. But I'm really pleased with the yearly use number. I have one more backing to make for a quilt, and then it will have to be bound, so the usage number might top the 130 mark by the end of the year. And I have a leaders and enders project that is about 15 four patches away from going into assembly stage, so I might be able to count that by the end of the year, as well. I'm linking up with Judy's stash reports at Patchwork Times And Kathy's slow Sunday stitching report at Kathy's Quilts. I have last week's and today's blocks finished. Last week was a block called Bride's Knot. They are now sashed and added to the growing quilt. I really like this idea of sashing them and sewing them together as they come out. There are now 2 rows completed and sewn together. At the end of the year I will have a completed quilt, rather than still having the job of sewing it all together. I'm not sure whose blog I saw the idea on, but it was a great idea. The lighting is really bad in the room where these are hanging. I tried adjusting the light exposure in iphoto, but it is still quite dark, but it is good enough to give an idea of what it looks like. I have 2 great finishes this week, both Christmas gifts for our Grandsons. The first is what I've been calling Avery's Truck Quilt. I'm not too terribly good with creative and catchy names for quilts. I first saw this particular quilt design over on Jamie's blog here. I asked her if I could use the design, and she graciously said yes. I quilted it with an all over design called Hotwheels, designed by Dave Hudson, and purchased from Digi-tech Designs. The design shows up really well on the white areas on the backing. The bindings were done with my now normal faux-piping technique using the border fabric as the binding, with just an accent of orange in between. 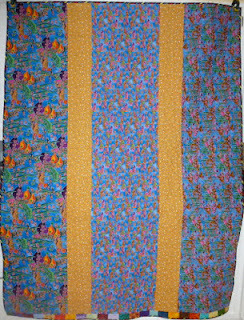 The backing was made with leftovers from the fabrics for the quilt top, plus other fabrics that I thought said something about Avery. There is book fabric in there, because he loves his books, yellow and chocolate lab fabrics, because he has a chocolate lab named Shelby. There are sailboats, because he loves the water, and lives quite close to it. The back was almost as fun to piece as the front. 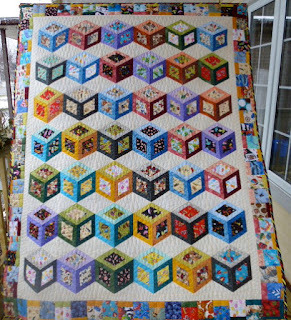 Then the other finish I have is Jack's quilt, which is a pattern by Judy Martin, called Celebration, found in her book Scraps. I quilted it using a very simple continuous curve. 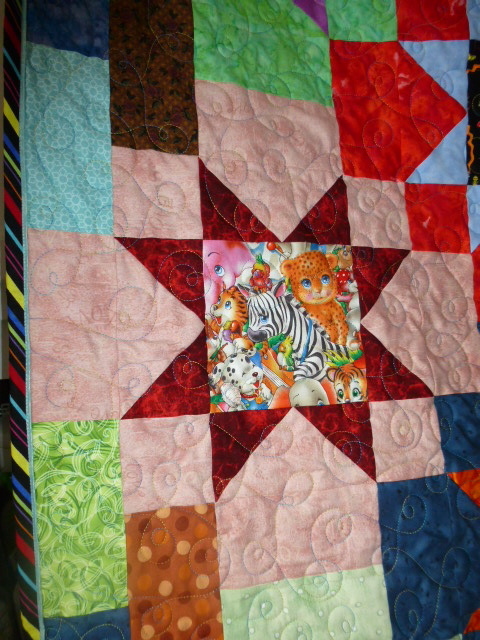 I wanted all the fun fabrics in the quilt to be the focus, rather than the quilting. His binding is a diagonally printed stripe, with red as the piping contrast. I had some really fun fish and ocean themed fat quarters that I could never quite bring myself to cut into, since they are just so much fun to look at whole. So I pieced them into a backing. Here's a close up of one of them. These were such fun quilts to make. There are still 2 more, waiting to be finished, as well. I'm linking up to the blog Crazy Mom Quilts for the Finish it Friday posts. 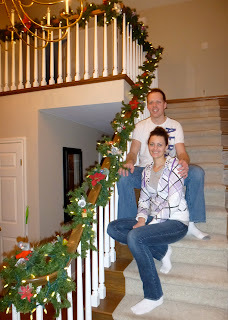 Matt and Becca invited us over to their new house to help decorate for their first Christmas in their house. We had a great time. They have been using our old artificial tree for the last few years, when they were living in their apartment. 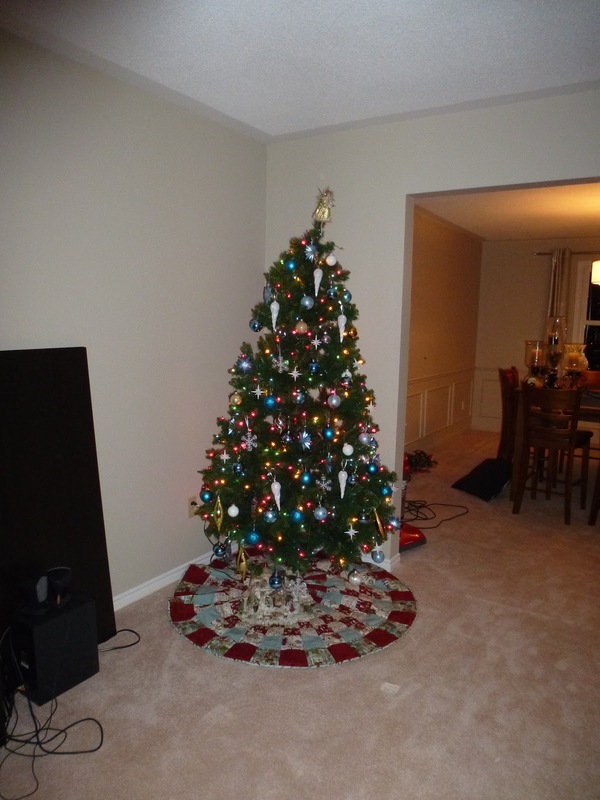 Putting that tree in their new house has emphasized just how much more space they have there. We always used to struggle every year to come up with someplace to put it in our house, since it took up so much space, and our house is so small. Well, over at their place, that poor tree looks lost. LOL! We aren't doing any decorating here this year, what with planning for the move in January, so they graciously offered Scott the top of their entertainment unit for his annual Christmas village. It looks so pretty. 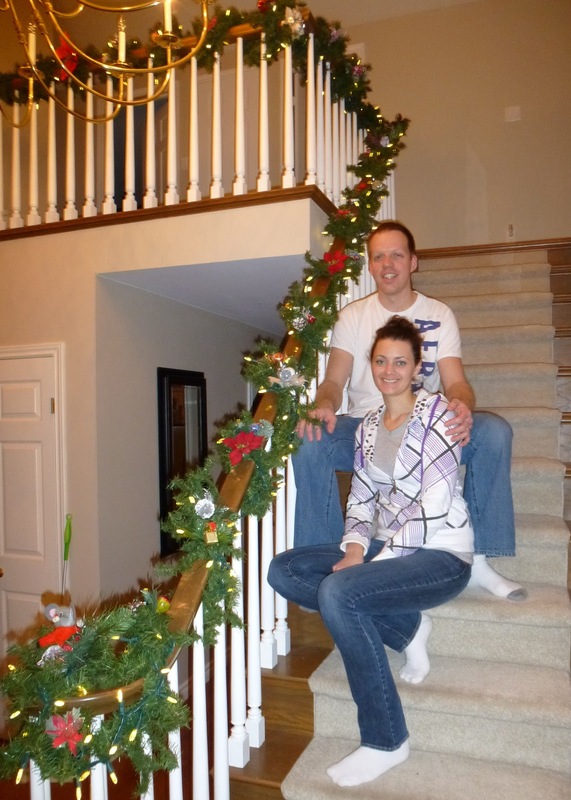 Here they are, sitting on their lovely staircase. You know the only thing missing, that would have made it perfect? Grand kids!! LOL!! Oh well, they are young. Maybe in the next year or two. I am so thankful to God for these 2 people, and so filled with joy for them, too. They have worked very hard in the last couple of years to achieve their goal of buying a home, and God blessed their efforts. A couple of years ago they went for a 2 month course on Bible based stewardship and money management, and they have been faithfully following those guidelines. And I continue to be so thrilled and thankful for their gracious offer of a home for us with them. The work on our space continues to go well. You would think that while we were over there, I would have taken a picture of it, but I somehow forgot. Probably because, while it is looking a little better, it is still hard to see what it will be like when the work is done. This week they are supposed to be doing the tile in the bathroom, and starting the framing for the sewing room/studio space. Next week, the kitchen cupboards arrive, and the gas fireplace goes in, and then they will probably start to dry wall the ceilings and the small parts of wall that need it. That's when it will start to look finished, and I'll get some pictures of it. Very, very exciting!! There is nothing on my wall...... zero, zip, zilch. I'm focusing on getting quilt tops quilted. I have Jack's I Spy quilt on the machine right now. I debated with myself for quite a while just exactly how to quilt this. The first thought was a pantograph of some sort. And then I thought of diagonal lines going from corner to corner through the I Spy squares. 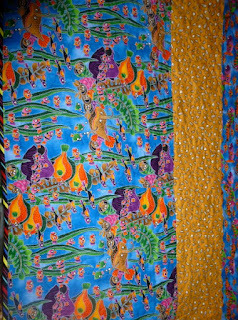 But the more I looked at it, the more I thought the the quilting should highlight the fabrics, and not compete with them. So, I am going with a very basic continuous curves. This will keep the fabrics and colours the focus of the quilt. This is the second of the grandson quilts that have been quilted. Avery's Truck Quilt is finished, and waiting for a trip through the washer and dryer. I'll have a picture of it later this week. 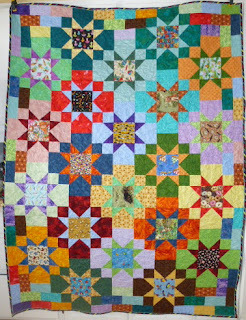 I'm linking up to Judy's Patchwork Times Design wall Monday. Lots and lots of great stuff to see over there.